In our last devlog (#2) we talked about movement and demonstrated how it worked on our digitally hand-painted campaign map. 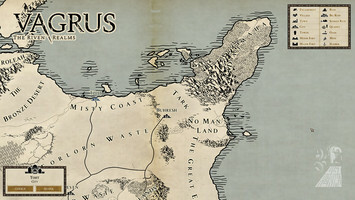 Since then, quite a lot of you have asked us to provide a map for the continent of Xeryn, where Vagrus is set. We are happy to share that the wait is over! 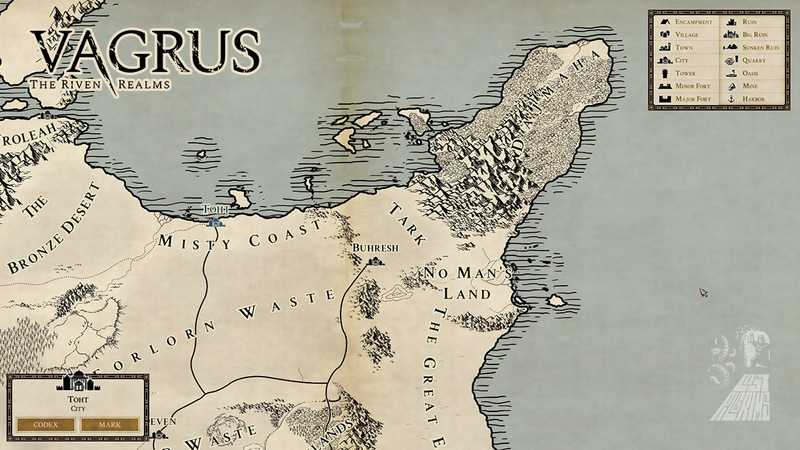 So in this third devlog, let's zoom out a bit together and look at the interactive continent chart of Xeryn, where the game is set. 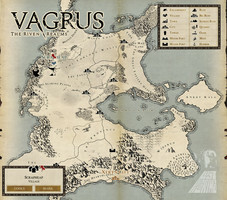 Maps are awesome, beautiful things. As it turns out, maps are also complicated things, especially when you have to integrate them seamlessly into several game systems. So it's been in the works for a long time and the video should give you an idea of how it'll work in-game. This interactive version shows most of the continent and as you can see, it's a gigantic and very detailed map. From a functional perspective, we've tried to mimic the easy navigation of Google Maps so you as players will be able to scroll in and out with your mouse zoom as well as and pan the map with left click+drag. The region and other location names are tied to levels that make them appear and disappear depending on your zoom rate, so you see major regions 'breaking' up into smaller ones, minor settlements coming into view, and in the largest zoom, other points of interest appear. 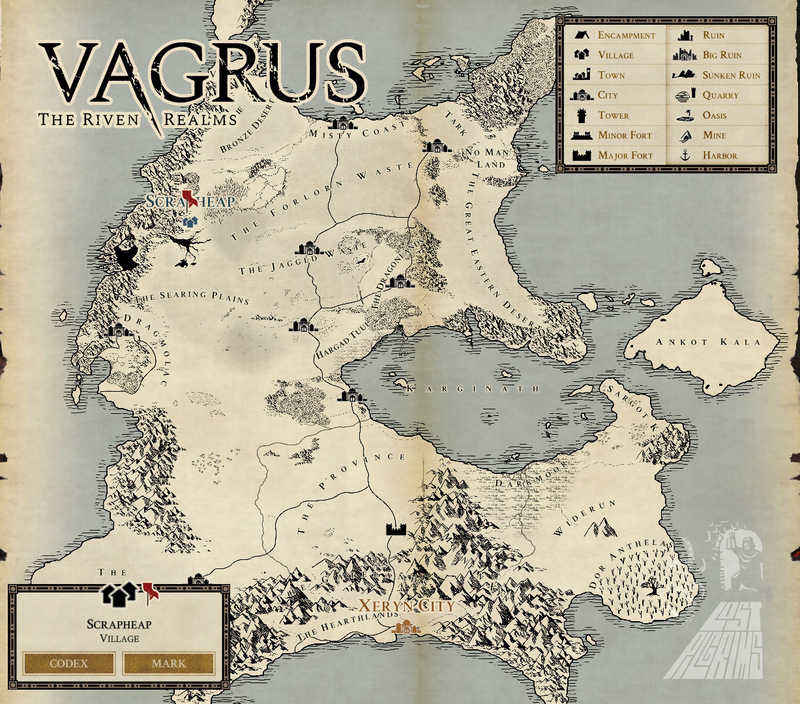 You, as the vagrus, the leader of your traveling company, might have many events, contracts, and rumors to consider when planning a longer journey, and the chart offers the possibility to 'Mark' settlements and other places so you would remember them. Another interesting functionality we added is the link to the Codex entries that are tied to that certain location. 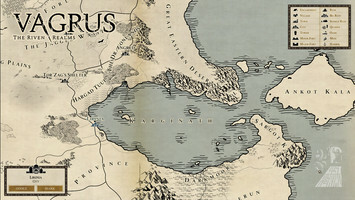 We will talk about the Codex in a future devlog but let's just say for now that the Codex holds all the lore and background story about the world, ordered into entries tied to cultures, people, places, etc. Consider it the in-game wiki of the world, except you don't start with all that information readily available but you need to gather it throughout the game. 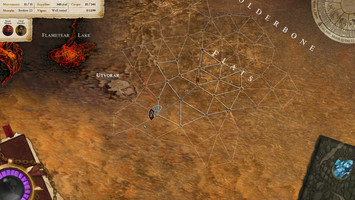 So back to the continent chart, the Prologue section of the game, which we plan on releasing this autumn, is taking place in the area called the Molten Tongue and then on the Searing Plains (it's pretty much the area you see when the chart shows up in the video for the first time). Later on, in Early Access, which we'll release sometime in 2019, the player is going to start from Tor'Zag's Shelter, which is both 'Marked' and shown in the Codex in the video. 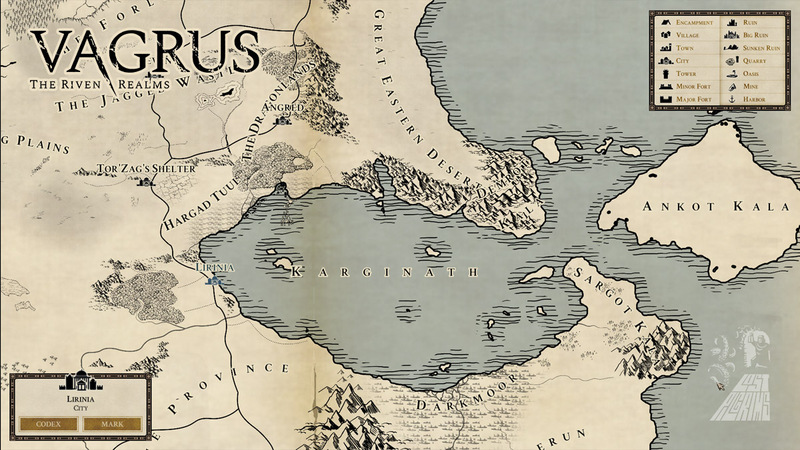 In our next devlog, we'll shed some light on how the setting of the Riven Realms came to be, what the main sources of inspiration were, and how closely its genesis was tied to our TTRPG sessions since childhood. We are very interested to hear about your opinion about the chart and the game, of what you have seen so far. Feel free to pose questions and let us know what you would be interested in to read about in future devlogs. p.s. : Don't forget to follow us here and on your favorite social media channel(s).